Comics Make Me Happy! : Does This Count As Beefcake? Does This Count As Beefcake? At first I was thinking shirtless Booster Gold. He's shirtless in like every fourth issue of his original series. Nah. Too easy. Then I was thinking cover of JLI #34. Nah, already included that in my Booster Gold cover countdown. Adam Strange always wears his uniform, or his Earth clothes, and even in that issue where he was in the hospital, the doctors let him wear his shirt. 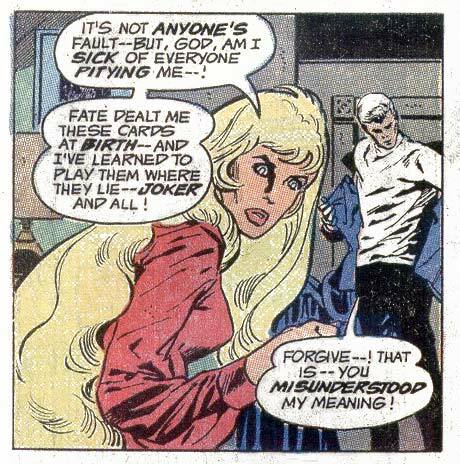 I then looked through every book I had with Two-Face in it and couldn't find anything, aside from some disturbing stuff in Batman: Jekyll and Hyde, where Harvey Dent is strung up shirtless while being electrocuted, and there's nothing happy about that. Then, I was thinking, ever see the movie Gypsy? Where Natalie Wood plays a classy stripper who just waltzes around the stage, does a little dip, then takes off a glove before exiting the stage and leaves the fellas wanting more? The Phantom Stranger takes off his suit and hat. That's pretty much like seeing him shirtless, right? It takes a man of mystical powers to make a turtleneck look THAT cool. Well, he strikes a pose or two, and then hurries up and puts that suit back on like it part of some sort of mystical rule he has to abide by. Oh, and I forgot to mention, he didn't take off his suit, Cassandra did. 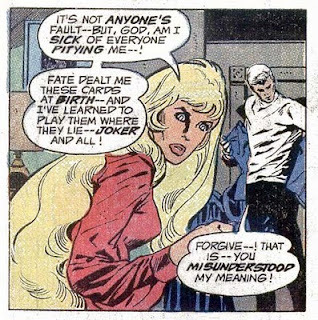 And before you get any ideas about Mr. Phantom Stranger's virtue and what he's doing in a strange girl's bed, it's all because she took him home after she found him after he got mugged and beaten up in the subway and he was taking a little nap. It's a shame things like finding a beaten up superhero on my way to work doesn't happen to me in real life. 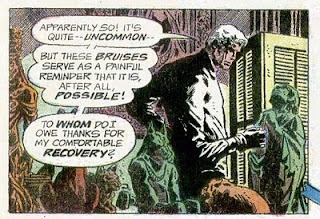 Well, there's my contribution to Beefcake Week, classy Phantom Stranger style. Wow! A hatless Phantom Stranger is the equivalent of a shirtless superhero ANY day! Eyz, as long as your words don't come out in that hard-to-read font that Etrigan speaks in, I'm okay with rhyming! Pop quiz for the weekend! Do We Feel This Way About Comics Now? Comic Fan Art That Makes Me Happy!